In a lost city in a remote jungle, located in what is now Belize, Central America, Anna Mitchell Hedge found this magnificent and perfect crystal skull, buried beneath an altar in the ruins of a great temple-pyramid. This article was published in New Dawn Special Issue 8. CHRIS MORTON & CERI LOUISE THOMAS are independent television producers who specialise in making films with a philosophical, spiritual or environmental emphasis. 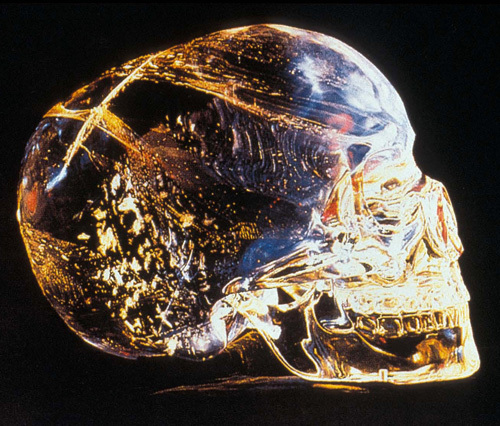 Their highly-acclaimed documentary ‘The Mystery of the Crystal Skulls’ has been shown around the world. They are also the authors of the best selling book, The Mystery of the Crystal Skulls.